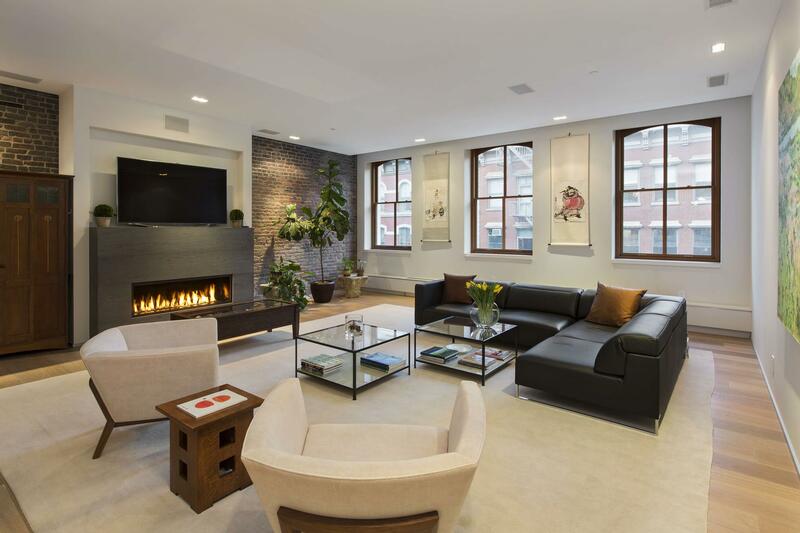 In the heart of Tribeca, enter this spectacular 3,627 square foot 3 bedroom 2.5 bathroom full-floor loft through the direct keyed elevator, and find a palatial home meticulously designed for luxury living. Interiors by world-renowned designer Leopoldo Rosati feature the finest finishes and craftsmanship; clean lines, rich natural materials in a subtle palette and peerlessly executed workmanship. Featuring Siberian oak hardwood floors, high ceilings, 12 large sets of windows and 3 sun-kissed exposures, this home is filled with incredible light. The cheerful living room is outfitted with a beautiful gas-burning fireplace with stone surround and a wall of custom wood-sash windows. Continuing through the home you will find a dramatic dining gallery, leading to a gorgeous windowed state-of-the-art-kitchen with top of the line Miele and Subzero appliances, including a vented cook-top, convection oven, a fully integrated coffee and cappuccino system, a large island, stone counter tops and pristine custom-milled cabinetry. Continuing onward, a hallway lined with floor to ceiling wood-paneled closets leads to the second and third bedrooms, plus a full master-sized bathroom. On the south side of the home, the master suite is a haven unto itself. There is a large sitting area, enormous walk-in closet with custom milled white oak cabinetry, and dual entrances to the lava stone-clad master bathroom. Additional master bathroom finishes include a Carrara marble vanity, custom wengee wood cabinetry, a walk-in rain shower with Grohe fittings and a deep Hydra System Lacy tub. 55 Warren is a 4 unit, 6 story loft building built in 1854 and meticulously converted to luxury condominium homes in 2011. Each bespoke condominium offers the highest level of privacy as a full-floor residence and is complemented by a part-time doorman/concierge, 24-hour Virtual Doorman, and private gym. Private storage room included.